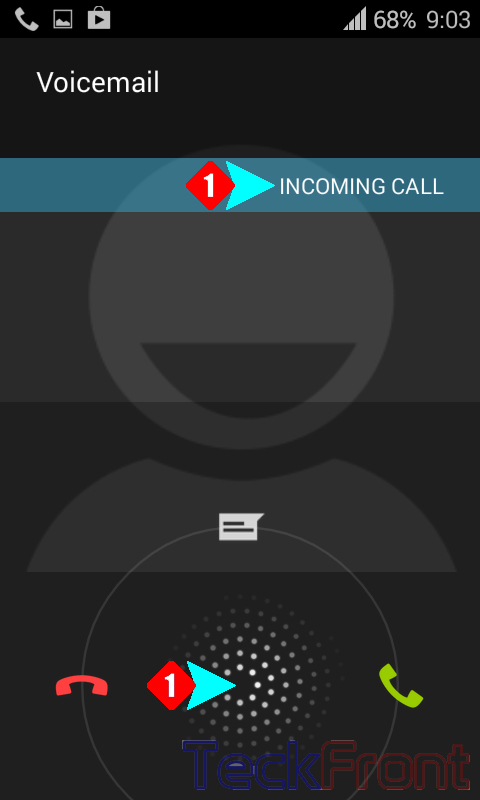 How to Answer a Call with SMS-Quick Response-in Android KitKat phone? Receiving the call during some odd occasions becomes difficult, e.g. if you are in the office, meeting with boss, having a meeting with client, intimate moments with spouse or friends etc. In many such situations it becomes annoying to answer the call and yet you feel need to answer the call. The Android KitKat offers a solution for such problems. You may, quickly, respond the incoming call with a SMS. 1: You observe that a call is coming. Though you are busy yet you feel to answer the call is equally important. 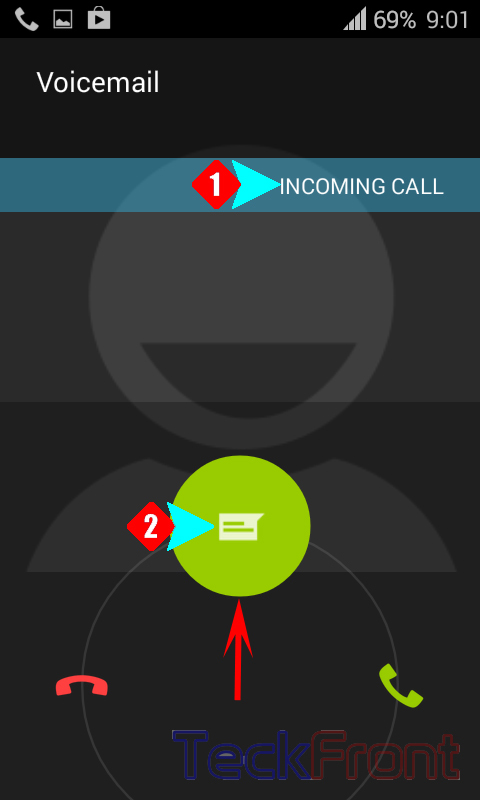 2: Tap the incoming call button on a popup on Home screen of your phone on with a finger. See the three different popup buttons will appear up. Now, move your finger, you have tapped, to the SMS button. 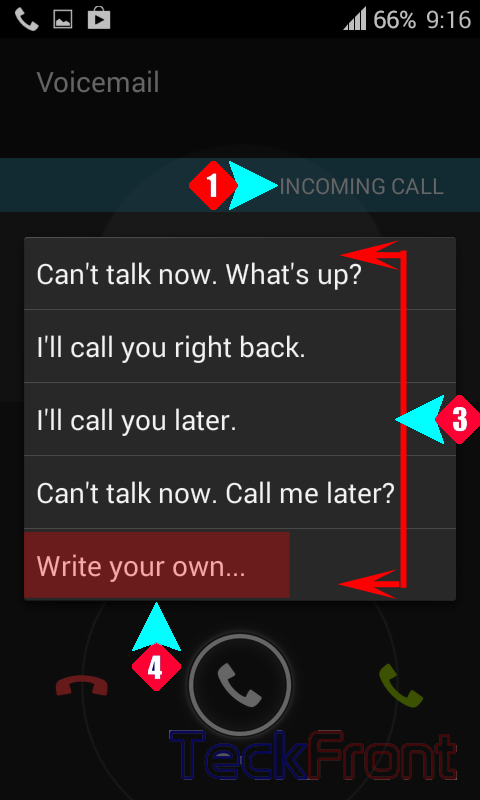 3: It will open up the menu on the incoming call screen where four different pre-written messages are available. You may tap any of them to send the caller informing him/her about your inability to attend his/her call. Your Android phone will immediately send a message to the caller. 4: If you want to write your own SMS, you may tap the 5h message, i.e. ‘Write your own …….’ And a prompt with a keyboard will appear to facilitate you to write your own message, as per the your choice and need. That’s all! If you want to modify any or all messages, according to your desire or choice, you may do so as well. For the purpose, visit our next post: How to Modify Messages for the Quick Response to the Caller? Newer How to Edit Messages for Quick Response to the Caller in Android Phone? Older How to Enable / Disable Dial Pad Touch Tone in Android KitKat Phone?